Home » Blog » Making of » The making of Rotello – Do gabbers dreams of bald sheeps? 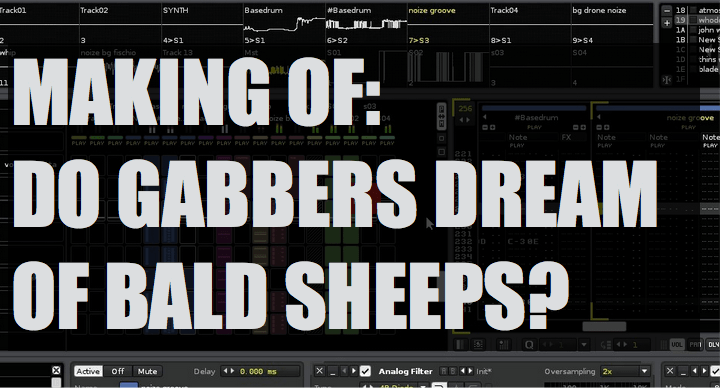 The making of Rotello – Do gabbers dreams of bald sheeps? Since I always loved when producers tell the “making of” a track, I decided to do the same in my little and total ineptitute in music making. Let’s start with the idea. I am not able (nor it s useful) to replicate verbatim the drum pattern of the above song, but i loved the idea. I searched on google “bongo wav”, “sword”, fencing, whip and so on and found a nice series of samplez, played with them and a good enoigh groove came out. At the beginning v 01, v02 I used a sample of MMA fighter Conor McGregor and me speaking ( I met him and have a chat during a UFC in UK before he was a super star). I then decided that it was too light and fun for a Darkcore track, So i Took it away. in Mid December the Trailer of Blade Runner 2047 came out, i loved a couple of noize there (see step 6: noize & Bg) and also found a “ok” vocal, which i could use also in the final version. basically the Bridge / pause is still with the base but it s half speed, and in my plan should build up to second part. I am kinda happy with that. v01 was already good, in v 02 the whole whip & industrial sound were very well melt togheter.